Yes that’s right, we would like to thank each and every one of our loyal customers for making our next venture possible! This new facility will offer a new elevated dining experience, full bar, and private dining. In anticipation of the opening of CHOW, Serrano Brothers current location will be closing in July. 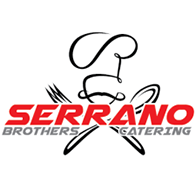 Serrano Brothers is just moving into our brand new digs with new menu items and a new location to better serve our guests! Stay tuned for more info at serranobroscatering.com or like us on Facebook!